These courses have been prepared for brethren who are serious disciples of the word of God and there are four courses available. - Nine modules based on the teaching manuals and two seminars. - Seven modules based on the teaching manuals, the book 'Walking in Our Inheritance' and two seminars. - The book 'Apostles Today' and four modules based on the teaching manuals plus actual teaching from nine teaching brochures. - Eight modules based on teaching manuals plus actual teaching from ten teaching brochures. Each course includes verse by verse studies of books of the New Testament. In Cert 1 and Cert II, we recommend that the class reads through the Scriptures together, making sure that all participants understand the Word. In Cert III and Cert IV, we recommend that students are nominated each week to prepare the studies and lead the studies in small groups of 6-10 people. Each certificate course includes practical components. • Memorizing Scriptures in particular subject areas, with at least one verse per week in Cert I and II and short passages in Cert III and IV. • Disciplined reading of the Scripture - the whole Bible in one year. Certificates will be issued at the end of each course to those who successfully complete the course. 2. At the end of the course to complete the teaching and graduate the successful students. Seminars need to be presented by an apostle or apostolic teacher. Curriculum - based on manuals, books, teaching tracts and a verse by verse study of various books of the New TestamentThe manuals and books that are to be studied will be made available to the acting principal of the course and copies can be made for all participants if that is possible. Each module is based on a manual [written by Paul Galligan or one of the team at Revival Ministries Australia] or a book, or teaching tracts. In Cert III and IV, the participants are to do the teaching from the tracts, manuals and books, and are to lead the scripture studies. The goal of the instruction is to make disciples and then train the disciples to teach others. We recommend that the school meets at least one half day per week and that at least two sessions are presented each day. Please note that some of the sessions in some of the manuals have recommended workshops that the students are expected to participate in. Each course is the equivalent of nine modules. Normally a module is one manual and the books in the course are equal to 2 modules each. Some of the sessions are longer and an individual session may take up to three hours. Some of the sessions are shorter and therefore more sessions can be covered in one day. Most of the sessions are average length and we suggest two sessions per day. Each session is normally a chapter of one of the manuals or the books. The students need to note the main points of each chapter's teaching as they study the material. When the study of the material is complete and the student has noted the main points, then each student is to write briefly how they see the word applying in the church today. In the Cert III and IV there are two modules that are devoted to developing practical ministry skills - preaching and teaching set biblical topics. Each Certificate course should be successfully completed in approximately 30-40 weeks, following the above schedule. The following 9 modules are based on teaching manuals presented by Revival Ministries Australia. Module 10 is a Scripture study on the gospels of Matthew and Mark. There are no assessments prescribed but we encourage the teachers of the sessions to ensure that the students have understanding of, and are able to practise what is taught in each session. Some discipleship schools have devised assessment sheets but we have not been able to access and arrange such sheets. 1. What must we do to be saved? Please Note: Some of the sessions in this manual are long; we recommend that extra time is allowed. At least one chapter per week is to be studied together being led by the course teacher. If the School is finishing before 44 weeks, the final chapters of Mark can be studied together to complete the book. One verse of Scripture per week is to be memorised. N.B. Guidelines for Scripture memorisation are available but we recommend the course leader chooses verses from the context of the studies each week. 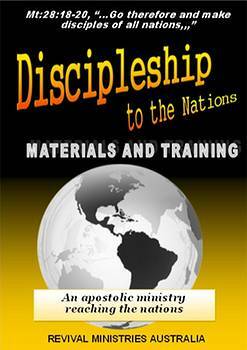 These are the details of the practical ministry required throughout Discipleship course I & II. Many churches neglect celebration of the Lord's Supper. Some churches have communion once a month, some once in a while and some never. In the Scripture the Lord's Supper was celebrated daily in the early church (Acts2:42,46). Every time the discipleship class meets, we ask the disciples to celebrate the Lord's Supper and for the teacher of the course to lead and model its practise. We encourage you every time you partake to have an expectation to meet with Jesus. Many churches have religious rules that have governed the conduct of the Lord's Supper and have excluded children from participating. We find that there are no such rules in the Scripture. The early Christians broke bread in the houses of the believers and we can rightly assume that every family member was included even as the Philippian jailer and his whole household were baptised in Acts 16:33. Children obviously can have saving faith in Jesus Christ; therefore children with saving faith can participate in the Lord's Supper and can be baptised in water. Jesus specifically said, "Suffer the little children to come unto me."Matt.19:14. Another issue that needs to be frankly looked at is the issue of the 'elements' used in the Lord's Supper. In the context of the Passover Meal in which Jesus gave us the Table, He used bread and wine, which were both Biblically and culturally accepted elements in that meal. However in Western Kenya, for example, it can be difficult to actually purchase bread as it is not part of the normal diet. Secondly we tend to use grape juice or some similar juice; we do not use wine as such, except in some of the older denominations. As an apostolic community we have been reading the Bible through annually for some years and we have been very blessed by being instructed by the Word through regular committed reading and study. Because the disciples are all reading the same passages of Scripture, this enriches our fellowship together. This course involves seven manuals and the book "Walking in Our Inheritance". It totals eleven modules and some sessions of the manuals may take longer than others. You will notice in the curriculum that each chapter of the book is to be covered in two sessions. Same as Discipleship Course I, please refer there for guidance. 1. Groundwork: God's plan, go forth! 2. Who are Apostles and what do Apostles do? 1. Leadership - "Men of good reputation, full of the Holy Spirit, full of wisdom"
2. Eldership - "Ordain elders in every place"
5. What is apostles doctrine? The Gospels of Luke and John (45 chapters). At least one chapter per week to be studied together being led by the course teacher. If the school is finishing before 45 weeks the final chapters of John can be studied together to complete the book. This Course will take the students deeper in the word of God and will be more focused on training and equipping the students to minister to others through practical ministry. The curriculum is nine modules, which includes four teaching manuals, the book "Apostles Today" and nine teaching tracts. Each week a student should be assigned to minister by presenting a teaching from the teaching tracts on a particular subject (see Module seven for details). Also, each week in the Scripture Studies session (see Module eight for details), the students are to separate into small groups of 7-8 people. These groups are to have a different student each week assigned to lead the study. Same as Discipleship Course I & II, except that now a different student should be assigned to minister the Lord's Table each week. Module Seven: PRACTICAL - Teaching from tracts on particular topics. Each student begins to teach. Each student must be able to teach/preach for 20 minutes on nine of the subjects outlined in the tracts. Initially each student will present the teaching to the assembled class or if there is a larger group, a class needs to break into smaller groups to enable everyone to do their presentation. However once the students have had two or three practices they are then required to find a small group outside of the discipleship class to share the word with. This will be a real opportunity for each student to begin to reach out in ministry. 3. What is the Bible? 4. What Foundations are you Building on? 7. Which Church do You Belong to? 9. Are there Apostles Today? At least one chapter per week to be studied now with a student leading a small group of 7 to 8 people. If the school is finishing before 41 weeks the final chapters of Hebrews can be studied together to complete the book. Short passages of two to four verses per week are to be memorised . This course is a continuation of deeper studies in the word of God, as well as refreshing the students in the basic principles of Christ. There are Eleven modules which include seven manuals and ten teaching tracts. This Course functions the same as Course III (see introduction to Course III), with the focus being on training and equipping the students to minister through the teaching tracts (see Module nine) and the Scripture Study groups (see Module ten). 1. What do you say about Jesus? 5. What is the Bible? 3. What Prohibits a man from being a Disciple? 1. Jesus and the Bride - Are you in love with Jesus? 8. The Church! The Kingdom! Module Nine: PRACTICAL - Teaching from tracts on particular topics. Each student begins to teach. Each student must be able to teach/preach for 20 minutes on nine of the subjects outlined in the tracts. Initially each student will present the teaching to the assembled class or if there is a larger group, a class needs to break into smaller groups to enable everyone to do their presentation. However once the students have had two or three practices they are then required to find a small group outside of the discipleship class to share the word with. This will be a real opportunity for each student to begin to reach out in ministry. 5. Jesus said: "Do this is in remembrance of Me"
A study of the books of Galatians, Ephesians, Philippians and Colossians. If the course is divided up into four terms, each term you will study through one of these books dividing the book into a passage per week that completes one book per term. Short passages of two to four verses per week are to be memorised.